University of Ulster research excellence in the area ofeducation, conflict and international development has been recognised byUNESCO. 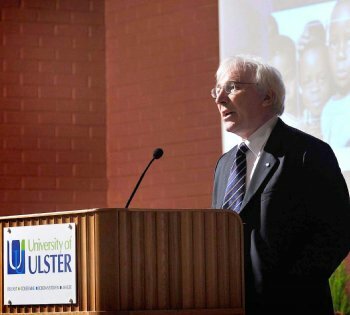 The UNESCO Chair in Education for Pluralism, Human Rights and Democracy – the only UNESCO Chair in Northern Ireland – held by Professor Alan Smith in the School of Education on the university’s Coleraine campus, has been renewed. Welcoming the news, Professor Smith said it was a strong and welcome endorsement of Ulster’s UNESCO team and its work over the past decade and plans for the coming years. Professor Smith said that the UNESCO team at Coleraine provide a unique resource dedicated to bringing forward research solutions to some of the biggest challenges facing both Northern Ireland and the international community. The focus of Professor Smith’s work in the past year has been onfurther development of research related to education, conflict and international development. His research, in collaboration with UNICEF, has been widely published and presented at international conferences in Italy, Belgium, Sierra Leone, Bosnia, Nepal and Sri Lanka.